Sorry I've been absent all week. It's marching band season and it seems I have little time for anything else ~ which includes making cards and blogging. I made this fall card with the Circles of Christmas stamp set by Gourmet Rubber Stamps. I just haven't been able to make myself get the Christmas papers & doo-dads out yet, so I thought this wreath might be pretty for fall. 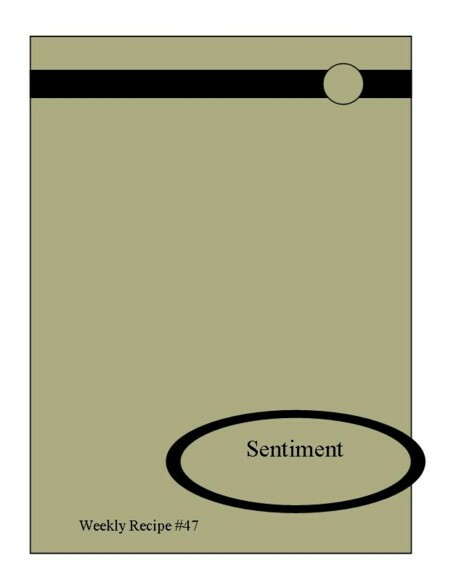 The sentiment is the Give Thanks single. Have a good weekend & see you Monday with a project from the latest GRS Release!!! GRS Challenge Day ... Thinking ORANGE!!! Hello, Hello! Hope everyone is having a splendid week so far. I'm excited to show you today's project because I love stamping for Halloween and today is the Gourmet Rubber Stamps monthly challenge for the designers. 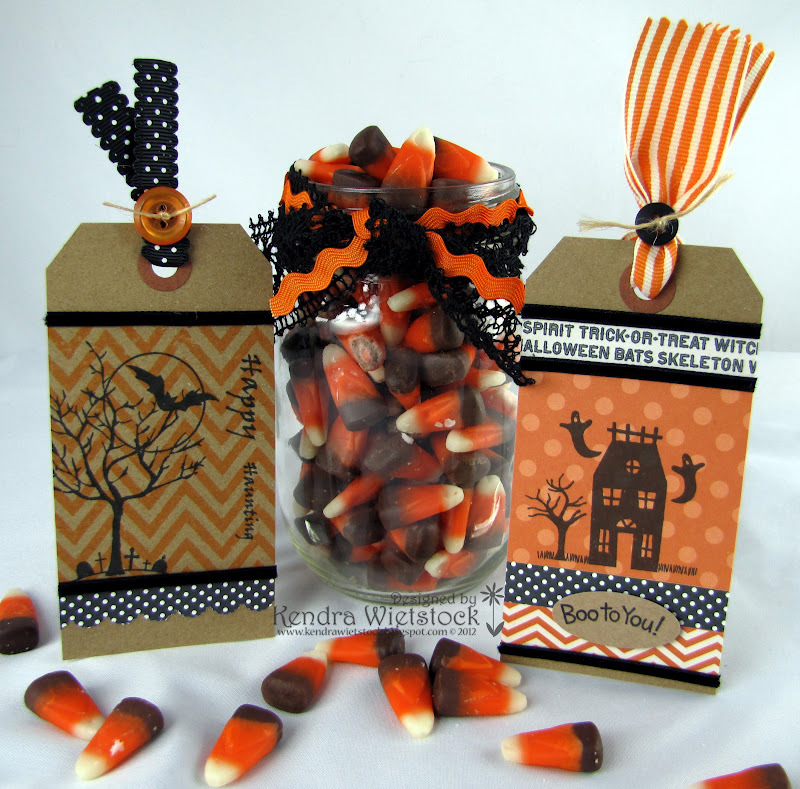 We have lots of great Halloween images, and I pulled out almost all of them ~ Ghostly Greetings set, a few new singles (Spider Web, Grumpy Spider, Simple Happy Halloween), Spooked set & Hallow's Eve set. 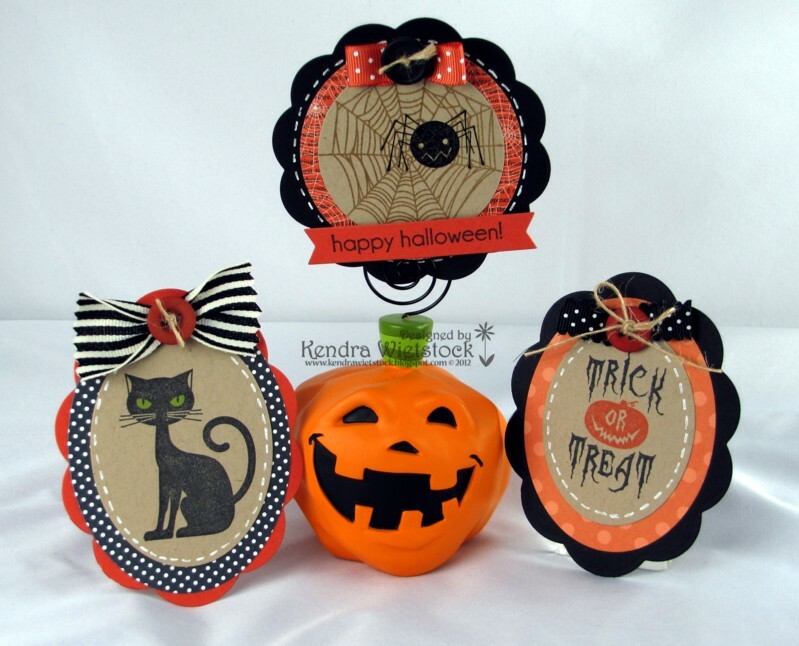 I also pulled out my Chevron Stripes background stamp and stamped it in orange on the kitty cat tag. Don't you just LOVE THEM????? 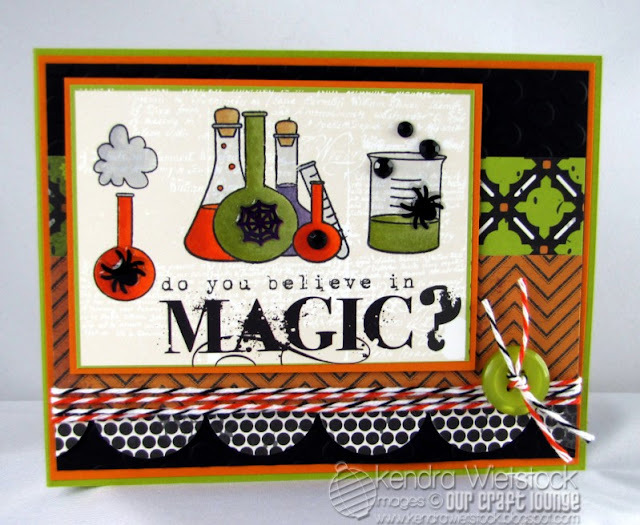 Fall Stamp Sale! Take 25% off any order through the end of September! 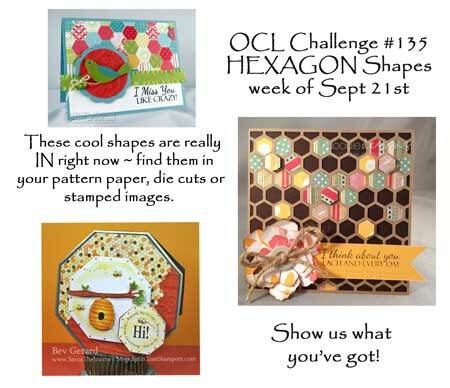 It's OCL Challenge time and today we are using the very trendy HEXAGON shapes! I used a cool new die from W-9 with various pattern paper from My Minds Eye. To finish off my card, I pulled out the Everyday Sentiments set by OCL. Sweet & simple ~ just the way I like it! 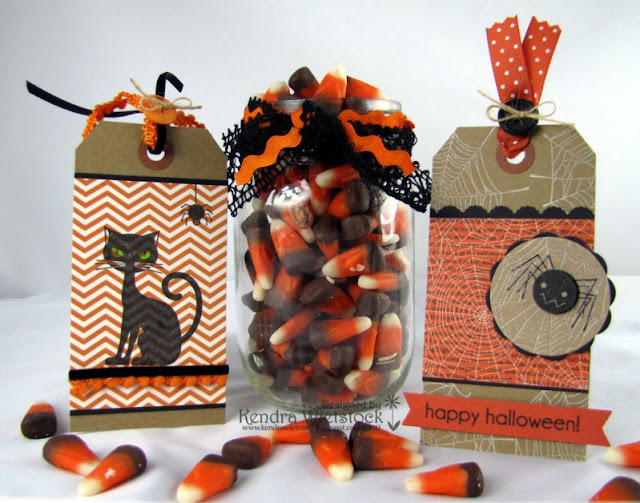 I love seasonal sets ~ however, it's also fun to figure out ways to use those seasonal sets for other occasions. For example, I used the great fireworks images from the Happy Independence set by Gourmet Rubber Stamps for flowers on my thank you card below. I embossed them in white pigment ink with white embossing powder on colored cardstock then popped them up with foam dots. Then I machine stitched the stems and added gems for the flower centers. For the sentiment I used the Big Thank You single and again embossed it with white and embossing powder because I wanted it to pop off the card. I love, love, love making Halloween projects and had so much fun making these cute little tags with the new stamps by Gourmet Rubber Stamps called Ghostly Greetings & a few sneak peek images from the next Diners Set. I used pretty pattern paper from My Minds Eye and Memento & VersaMark inks from Tsukineko. It's the 15th of the month and that means we get to show you two new Appetizer sets by Gourmet Rubber Stamps. The first set is called Ghostly Greetings & I LOVE IT!!! Actually, I love making Halloween projects and this one was soooooooooooooooo easy & I'm super happy with how it turned out! 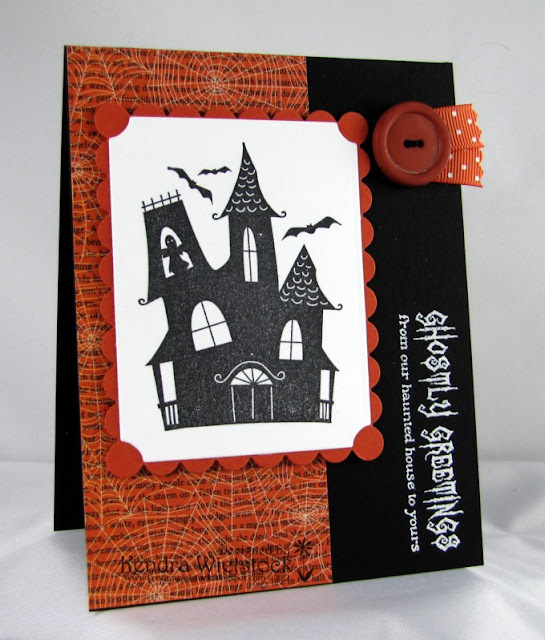 The pattern paper is from My Minds Eye and I used Memento ink on the haunted house. 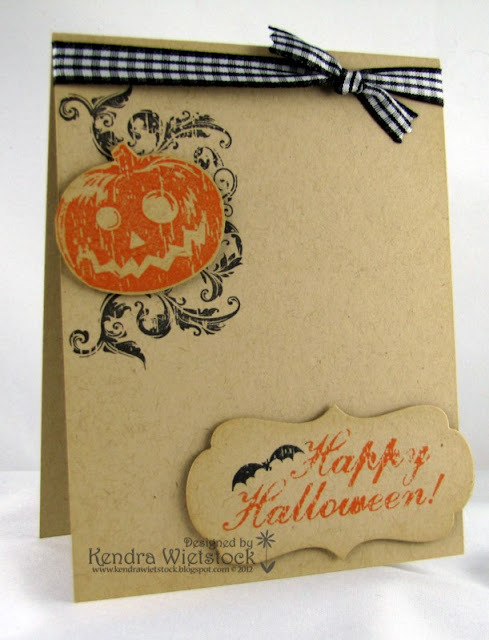 Then I embossed the super spooky sentiment with white pigment ink and white embossing powder. Tip: Don't use clear embossing powder or your image won't show up when heat embossed. Challenge time with OCL!!! Today we are revisiting TWINE! You may remember that we've done this one before, but it's such a fun project we had to do it again! Today I used a set called Love Potion for my project. It was intended to be a Valentine set, but I had fun making it into a Halloween creation! I just used spiders, a web and gem stickers to cover up the hearts on the images...pretty cool huh? The paper pack is from Echo Park and the bakers twine is from the Twinery. Now it's your turn to play along so go add your link to the blog post. Oh...and don't forget to download the free digital image that was posted on Monday. Is it time for a PIZZA PARTY? Sound fun to me! 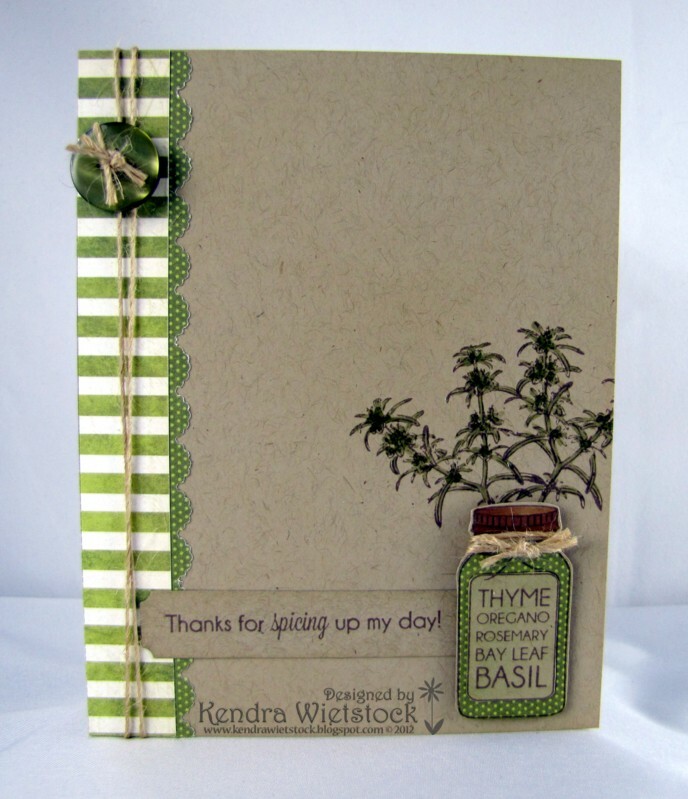 I used this great new set from Gourmet Rubber Stamps called Spice Up Your Day. The pretty papers are the from My Minds Eye Traveler collection ~ I just love the colors in this paper pack ~ and the inks are from Memento. I love the little pieces of popped up pizza in the corner of the tag. 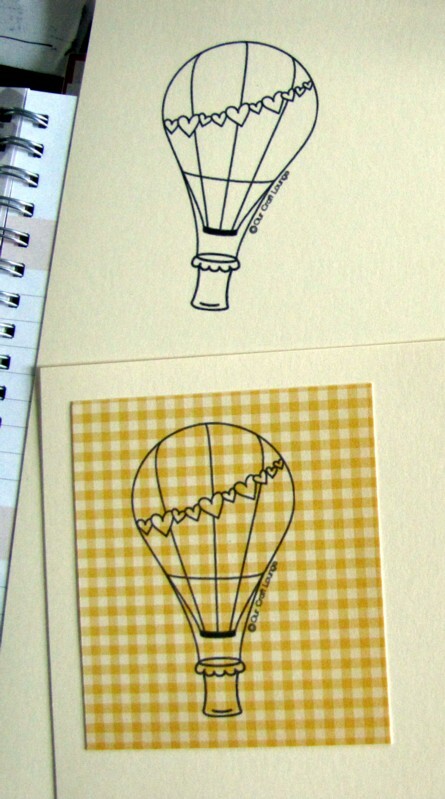 Each Friday on the Gourmet Rubber Stamps blog, we have a new Weekly Recipe sketch. Last Friday, it was my turn to host & this was my sketch. I decided to use the Invite to Fright stamp set on this super easy sketch and then add the frame & popped up pumpkin in the open space. Also, when before I stamped the sentiment, I inked the bat in black & left the sentiment in orange Memento ink so it would stand out. Play along and add your link to the GRS Facebook page so we can ohhh and ahhhh about it! I am SUPER excited today because Our Craft Lounge has a FREE digital image on the OCL blog today & it's so cute! The name of the image is Love Floats and it matches two of our other sets ~ Love in the Air and Spilling Over. Head on over to the OCL Blog and download the new image for yourself. 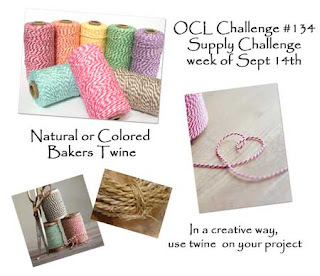 Then go add your link to the OCL Challenge from last Friday for a chance to win a great prize. 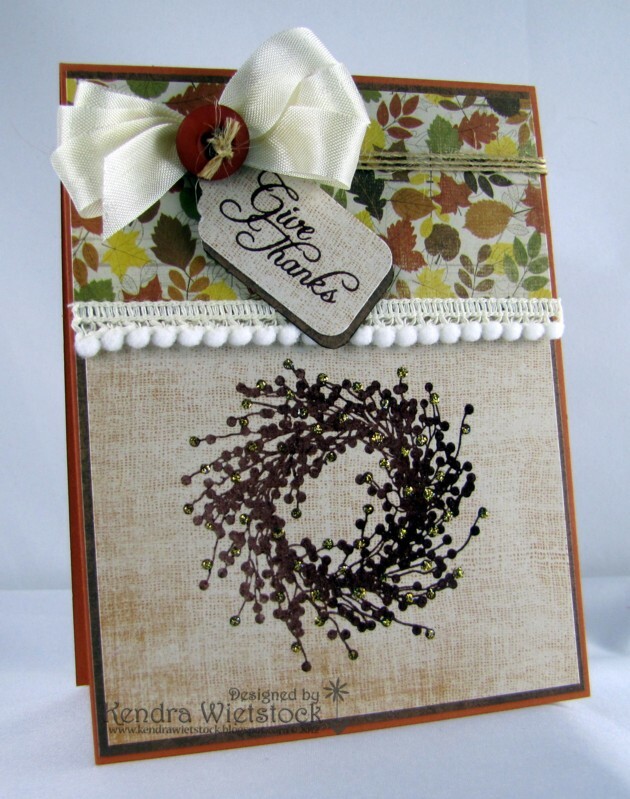 We may even feature your card on the blog & our Facebook page. Do you love paper piecing? Well I love it, but sometimes it is a little more challenging with digital images if you just have scraps of pattern paper. First print your image on the desired paper, then determine how big the image is and find the pattern paper you want to use. Take a full sheet of cardstock and use removable adhesive to adhere your pattern paper to it in the position where the image will print. Send it throught the printer, cut it out and you're done! On orders $25 or more (before tax & shipping) you’ll get 25% off. No coupon code required ~ it should calculate it automatically at checkout. Not applicable to wholesale orders or items that are out of stock. We have some FUN for you today! It's Friday and that means challenge day on the OCL Blog. 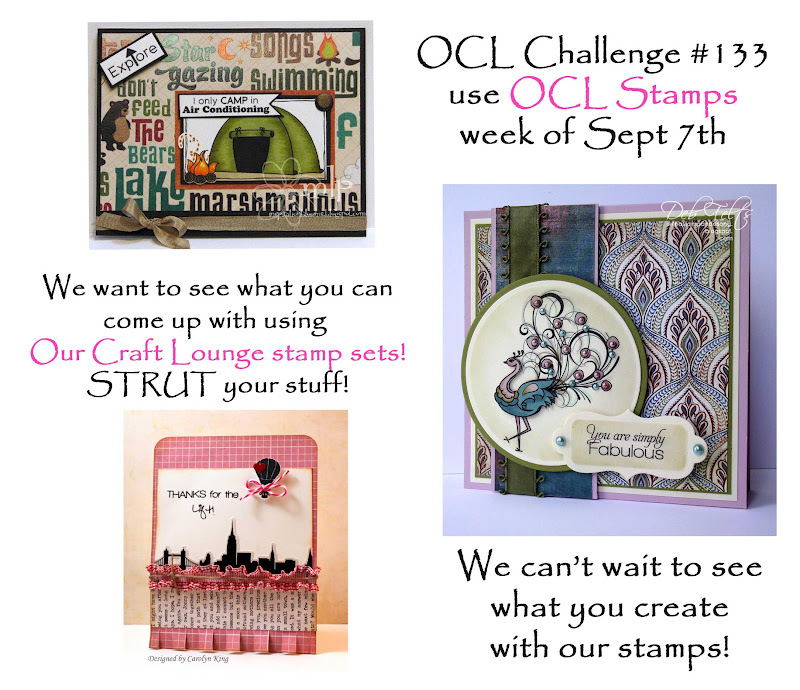 This week it's Anything Goes Week BUT you need to pull out your OCL stamps for the challenge. Today I used the cute set called Monster Hugs. It's a great set because you can use it for Halloween, birthdays or just because...too cute! I added some Punk Purple Sparkly Fluff on the monsters horns and tummy. Now you say you don't have any OCL stamps...well tune in here and on the OCL Blog next Monday for a fun surprise. YOU WILL LOVE IT! School bells are ringing all over the U.S. now and it's time to encourage our students with little notes and hugs throughout the year. It doesn't matter if they are in Kindergarten or a senior in collage, they still need our encouragement & support! So here's a fun file folder card I made that will be perfect for one of my kids in the next few weeks. 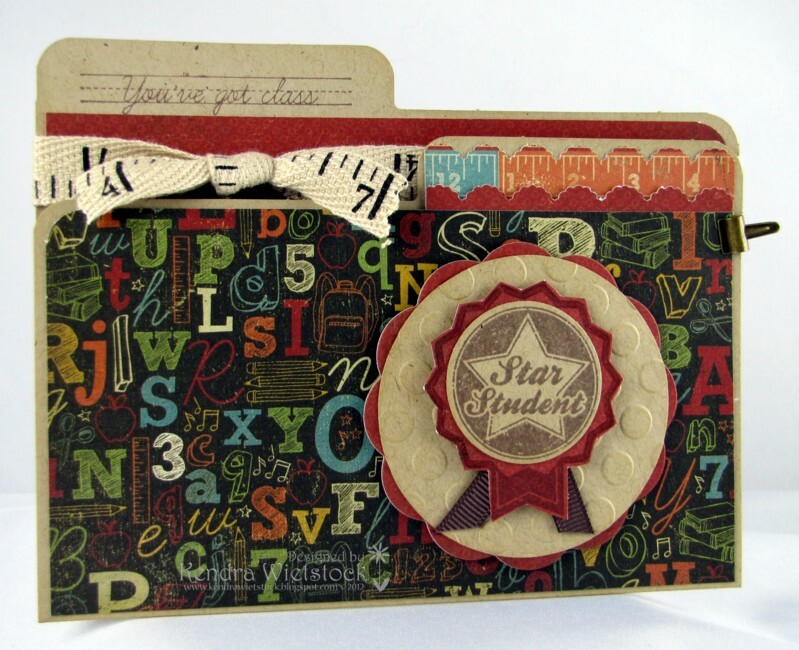 I used the new Old School set by Gourmet Rubber Stamps & stamped the image and sentiment with Rich Cocoa Memento ink. The paper is from We R Memory Keepers ~ LOVE IT! Have a great day & thanks for buzzing by! A Little More Spice from GRS! Hope your long weekend was fabulous & you're ready for a new week! Everyone should be back in school now, so that probably made your life easier & more complicated all at the same time ~ LOL! I know you busy moms out there understand what I'm saying. Today's project is one of my favorites from this month's Diners Set called Spice Up Your Day by Gourmet Rubber Stamps. It's such a simple layout, but I love that about it. I stamped the images with Rich Cocoa Memento Ink and then filled in the tiny leaves with my Copic markers. The pretty pattern paper that I used on the edge of the card and the paper piecing is from My Mind's Eye. I just popped up the spice jar with some foam dots and tucked the sentiment under it. Hope your day goes well and thanks for buzzing by today! Get Ready To SPICE things up with Gourmet Rubber Stamps! 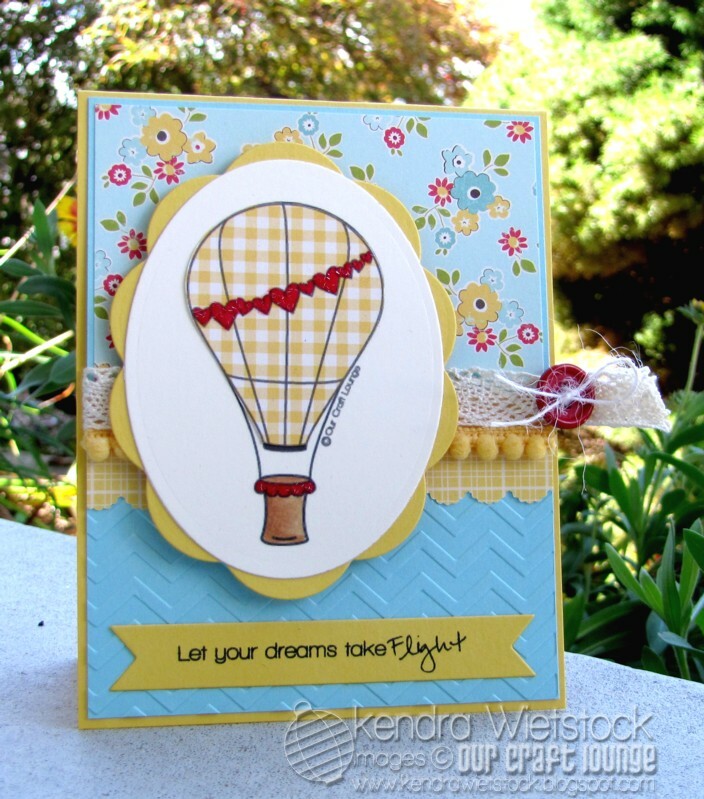 It's September 1st and it's time to Spice Up Your Life with Gourmet Rubber Stamps. That's the name of the new set & it's time to have some SPICY FUN! 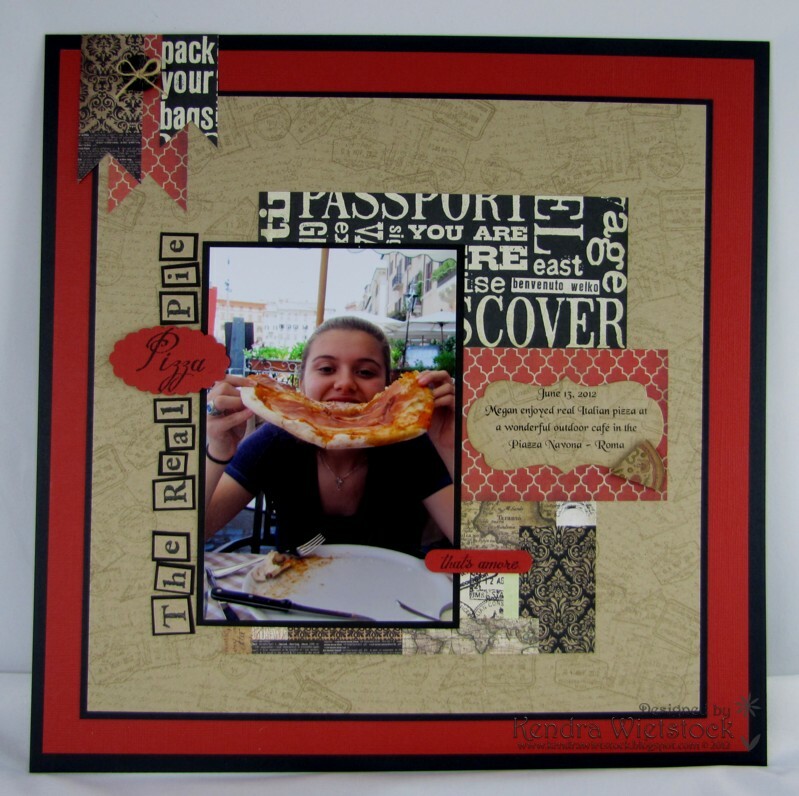 When I saw several pizza images & sentiments included in this set, I KNEW I had to do a scrapbook page and that I would use this great picture of my daughter eating pizza in Rome! Perfect HUH? I love stamping on my scrapbook pages and you can get great results with subtle stamping without going totally crazy with "in-your-face" images on your pages. After all, the star of the page should be the photograph(s). 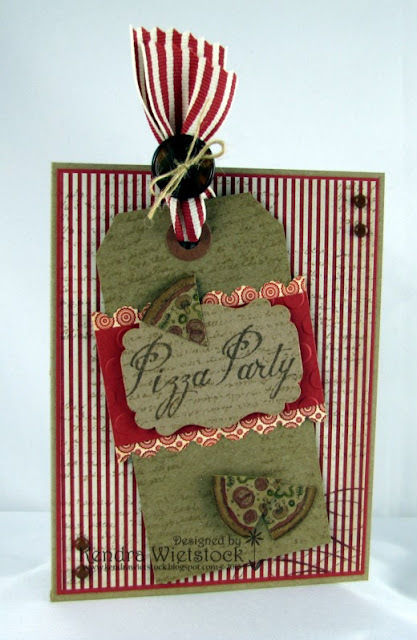 Here's how I did my page: I started my page by stamping the pizza recipe script from this set & the passport stamps from last month's Pack Your Bags set as the backgorund with Toffee Crunch Memento ink. I added bits of pattern paper from the 6x6 Traveler pad by My Minds Eye that I found at Michael's, under the photo and also for the banners at the top. The word "Pizza" in the title and the sentiment "that's amore" are all from the new set. Then I also stamped the full pizza image, colored it and then cut one piece of pizza to add to the journaling. The rest of the pizza was used on another project ~ clever huh? LOL! I know you'll want to see the whole set, so click on the GRS Blog to see the yummy new images. Then visit the other designers blogs to see what "spicy fun" they came up with!